Plas-Tech Engineering is a leader in syringe production, including Silicone-Free plastic syringes for the medical device, pharmaceutical, and biotechnology. Since 1998 we've delivered the highest quality plastic syringes to clients requiring an experienced supplier with exacting standards. Our ISO Class 8 (100,000) Clean Room molding and ISO Class 6 (1,000) Clean Room post processing allow us to maintain our leadership position from initial design through production. With recent advancements in pharmaceuticals, the syringe market has experienced significant changes. Traditional glass syringes have limitations that make them incapable of serving the entire market, allowing Plas-Tech engineers to develop plastic syringes as an alternative. Our COP & COC glass replacement plastic syringes are the answer, with improved accuracy and performance advantages over traditional glass syringes. Benefits of COP & COC plastic syringes over glass syringes: Available in 100% Silicone Free! ; DMSO Compatible; Lower cost options; Shatter resistance; Weight: 50% less than glass, thus reducing shipping costs; Very low protein and water absorption; Ability to design in ways impossible with glass; Chemical resistance is very good when compared to glass; NEW! DMSO and Organic Solvent capability for Pre-Filled syringe applications; Solvent bonded and ultrasonically welded; Options for EO, Gamma and Steam Autoclave sterilization; and Tub Fill or ISO Luer Lock Configurations. COP Plastic Syringes: COP (cyclic olefin polymer) plastic syringes have similar properties to COC syringes, but are even less brittle and can be made into more varied size and complex shaped containers. COP syringes are increasingly popular in applications where high viscosity products require high strength and high transparency to ensure the product is thoroughly injected. COC Plastic Syringes: Plas-Tech Engineering invested nearly five years in research and development of COC (cyclic olefin copolymer) plastic syringes for the pharmaceutical and medical industry. The unique processing methods we developed allowed us to produce a high quality product that exceeds the accuracy and performance standards set by glass syringes. The superior moisture barrier we deliver with our COC medical syringes extends the shelf life of some pharmaceutical solutions by 3 years, a standard that can't be met by other thermoplastics used in less challenging applications. With COC syringes, the drug remains pure because COC is biologically inert, with very low extractables. Silicone-Free Syringes: Many syringes in the marketplace use a silicone plunger tip for their seal on the pushrod that goes inside the syringe. Due to potential leaching of silicone, there has been a big push for syringes to be made silicone-free. Plas-Tech Engineering offers silicone-free syringes made from COC and COP, which are then coated with a Fluoropolymers. This creates a zero break force, controlled friction, and is also 100% silicone-free. 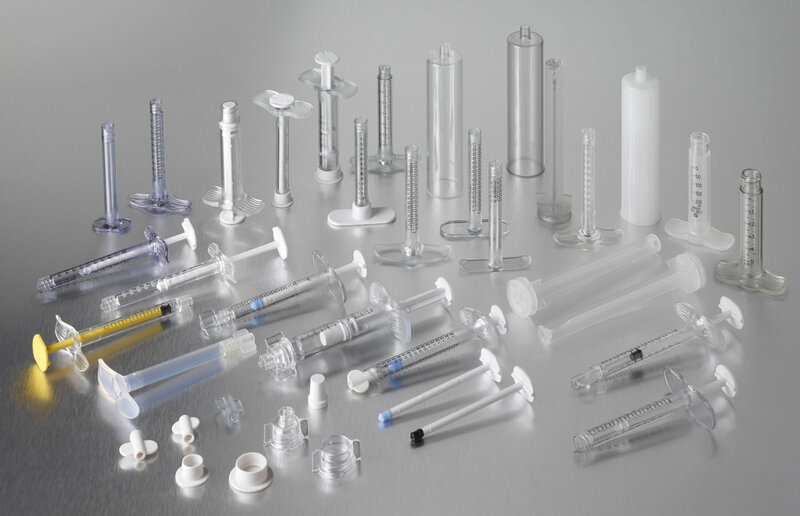 Other Plastic Syringes: Plastech Engineering is a leader in pre-filled plastic syringes that may be used in a variety of applications for safe, efficient delivery of pharmaceutical compounds.